For several years now this blog has lain dormant. Originally conceived as a catch-all for what I fancied were my more important thoughts as I began my senior year of college, it served its better times as a repository for my budding efforts as a medievalist and translator and as a travelogue of sorts during my year in Germany as a Fulbright Scholar. During my time as a graduate student at the Medieval Institute it went fallow, except for scattered personal announcements and to post a rough paper or two. Certainly the demands of graduate work and falling in love kept me from it; but far more, I think, did I forebear under the realization of my own incompetencies. My graduate committee broke the pride of intellect; to my wife I willingly sacrificed the pride of soul. It might seem presumptuous, then, that I should now attempt its revival. It is my certain hope (how vain is yet to be seen) that I can offer something worth while. When I recognize and shake my head at the naïve arrogance I once put on display, I hope that some more years along have left me a clearer, more experienced lens. Wise it may not be, but at least a bit more prudent. The drive to put down in writing the whirlwind of thoughts and experiences, both quotidian and extraordinary, is as strong as ever. One good idea might occasionally escape in that process by which the build-up of voice upon voice escalates until finally, from sheer dint of pressure, it is flung from the chaotic nebula of my head into the galaxy of the world outside. But as Chaucer noticed when he glimpsed this “Domus Dedaly / That Laboryntus cleped ys” (House of Fame, 1920-1), not even in these nascent moments of a story is truth purely found. The muddied waters of human expression are from their very source a mixture of truth and falsehood. I cannot promise pure clarity, but only that in the process, the journey might be a little less murky than before. Epistemological theorizing aside (for the moment), what concrete shape will this blog take? I can refer you to its very first post years ago, for the motivations remain much the same. As its title would indicate, it will reflect the experiences of a man of faith seeking to understand that faith and the world in which he exercises it. I will strive to understand the grand ideas that animate the course of human history, tempered by the practical limitations we face every day in living out those grand claims we make in our more idealistic moments. I am an academic; and the methods by which I explore this journey we call “life” will be, by and large, academic. I will read monographs and review them; scour the medieval religious texts I study for clues; and attempt to reconstruct the thoughts and experiences of men and women who lived centuries ago. Some of this work may hopefully find its way into print; at the very least, I hope to make more medieval texts available in English translation. As a teacher, my goal is to help new generations explore and understand the human story, whose conflicts and crises today echo anxieties faced by countless generations before. At my best moments, I hope to bring these fascinating figures back to life; most of the time, I will consider it a success to have told a coherent tale. But I must also be on guard lest I succumb to that danger that lurks in the path of any academic: the danger of becoming too ensconced in our Ivory Towers, reducing, as it were, the true complexity of the figures we study to the merely academic and scholarly. As I was reminded a few years ago in a visit to the Abbey of St. Hildegard of Bingen, the real rewards of our work should take us beyond the conferences and scholarly monographs and journals. I met there, for example, an Italian-German woman whom we “scholars” would term an “amateur”, that is, whose interest in Hildegard is entirely practical. She studies Hildegard, spends time at Hildegard’s abbey, and reads Hildegard’s works, not because that’s her job, but because she finds meaning for her own life in Hildegard’s. Hildegard’s writings on natural medicine are not merely important as documents in the history of science; for her, they become actual tools in regulating the ailments of her own body. Likewise, Hildegard’s theology is not merely a collection of theoretical notions; rather, this woman has actually allowed her own spiritual life to be taught by Hildegard’s teachings. 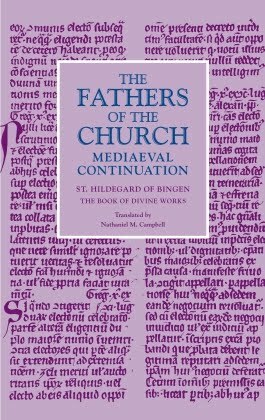 The vitality of Hildegard’s personality in our age is the product not of our scholarly researches but of actual people and their real encounters with an extraordinary woman of an age gone by. It is thus for us, the academics, not merely to write our books and give our lectures for the sake of other academics, but to realize that our profession, like all human activities, is meant to be for the advancement of humanity—and that such advancement is not merely an abstract goal of progress, but the concrete reality of people who live their lives in the here and now, perhaps weighed down by the weariness of day-to-day drudgery, yet also lifted up by the simple joys of day-to-day life, well-lived.